While I wish I could take credit for the wonderful centerpiece depicted in my Thanksgiving Pumpkin centerpiece photo, the real credit goes to my friend Jennie for creating it. She took a white pumpkin, cored it out at the top, and added fall flowers as the centerpiece for our Friendsgiving dinner a few years ago. Warm thanks goes to Wide Open Country for agreeing that this is a great way to recycle a pumpkin after Halloween and using my photo! To be fair, Jennie purchased this pumpkin from nearby Lemos Farm in Half Moon Bay, CA with the intent that she’d use it for holiday decoration in some way, but you could certainly re-purpose even a carved jack-o-lantern in this way! Place them on an end table or at the center of your dining table. 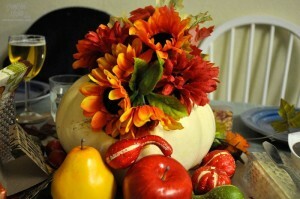 Surround them with dried corn, scented candles and Thanksgiving themed items for a quick transformation.